This is the size in conroe - Lake Houston Fishing! Did ya catch any crappie? Holy smokes that's a monster sticko!! Beautiful dark colors on that sucker. 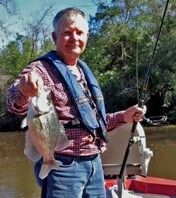 no crappie today i had a few big ones but that was the biggest. Kept 21 out of about 40 and one of weathermans turtles . did use live wigglers on them today. Man, I'd love to get on some of those. Every bit as tasty as crappie! I'm surprised that turtle got to your worm before a bluegill, must've landed right on top of him.